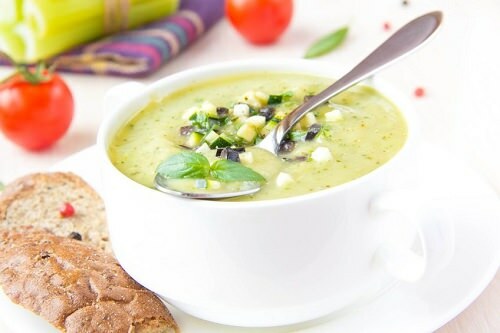 Avocado is a rich source of healthy fats, and the smooth creamy texture it creates is ideal for summertime soups. If you’re fond of guacamole, this soup provides a tasty alternative that requires very little prep time. Blend avocados, basil, cucumber, olive oil, salt and pepper in your blender until smooth. Let the soup chill for 30 minutes in the refrigerator and drink up.